Mint Chocolate: Her first day as year 6, hooray! Her first day as year 6, hooray! My big girl who is very diligent for school since 2 and a half yrs old. Daddy can't forget how he was kicked out from her classroom on her very first day of school. Even when she was a yr old she already love the idea of schooling. Imagine, how cute she was pretended that she is leaving for school. Daddy and I chuckled whilst watching her with her barbie backpack and shoes on waving like she is really going to school - oh so adorable! Luckily, she keep that mentality up to now. She still loves school and very eager to get up in the morning without my help. Not only that, she is also very independent and making her own breakfast as well as to her little brother. Sometimes, she even had to wake me up while she's all ready to go. And no exception on the last Thursday when she was all prepared as early as she can for her first day as year 6. So, here's a solo picture looking smart with her school uniforms. 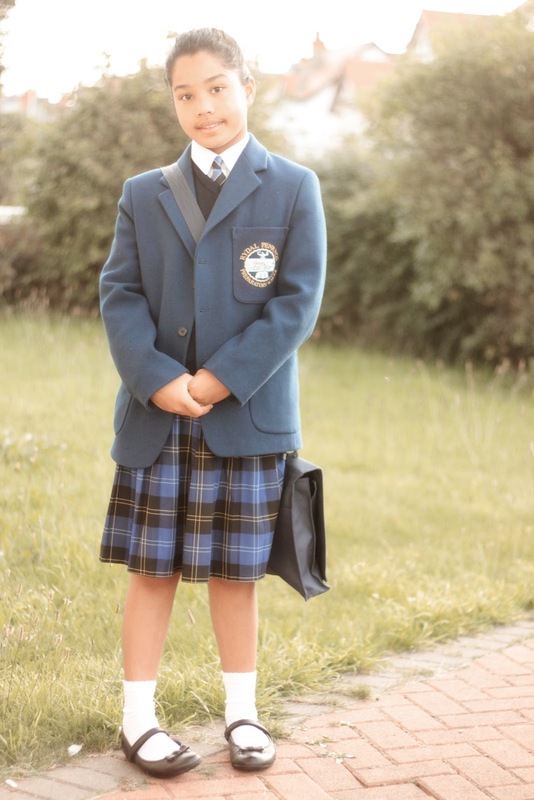 The white socks is only temporary as we are ordering for her proper school dark blue socks. Hoping it will arrived sooner. More pictures can be seen in my other blog together with her little brother, Christian. Anyway, I'm proud of her as she is keeping a good academic records year after year. So, I trusted her that this year she'll enjoy school even more. Settling quite quickly in this school was unexpected, her and Christian are both doing very well considering they're newbies. congrats sis! 6 years has been long! i still have more years, mine just had his school years for 2 years now. well done mommy! I wish my daughter will grow up like that...responsible and independent. aw.. she have grown into a fine little lady haze. i bet you are very proud of her. it is really exciting for parents to see their kids enthusiasm in attending school. its worth every penny. Wow! It has been that long already? Hay! How time flies really fast! Anyway, congrats! Dli magdugay madalaga napod ni imong princess oi...dali ra kaau ang panahon nagdagan.